Adventures of the Body, Mind, and Spirit. So, the old saying still holds true on many levels. A stitch in time saves nine. Here is a photo of my 1 year old backpack. They sure don’t make ’em like they used to! Before packing for my 2 month journey in Central America, I noticed a small 2-3 inch tear in the corner of my backpack. I fully intended to stitch it up before I packed and left. Alas, it proved difficult to find the correct needle and thread to do a proper repair. Finally, the night before my departure, my daughter and I found a store across town that had the correct items, a curved needle and upholstery thread. Items acquired! 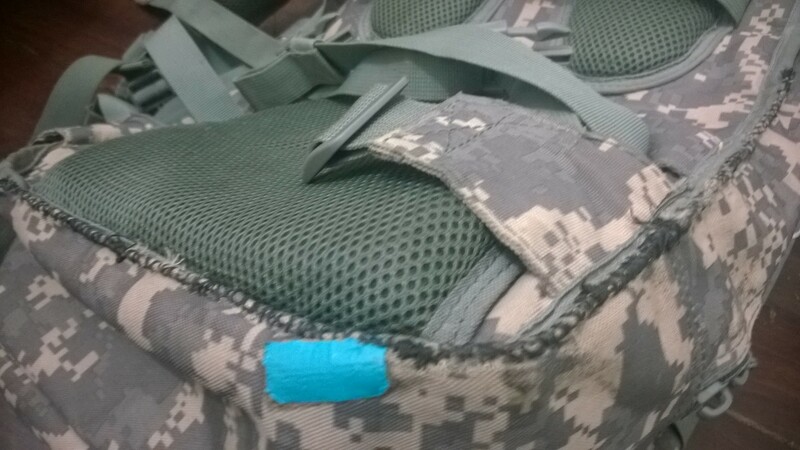 Upon examination of the backpack and the time left before departure, I convinced myself that it would hold up, and I could make the repair at my 1st stop. Admittingly, I was running a little behind in packing for reasons of procrastination, along with the need for these items to fix the pack. So, I got all packed up and ready to travel. The pack was less than 40 pounds, a good checked baggage weight. I got to my destination airport and found my backpack had ripped considerably more in transit. I gimped it along carefully on a cart to my waiting shuttle. At the shuttle terminus, I had dinner and called a 4×4 taxi to take me up a mountain to spend the evening and morning with friends. Two hours later a small 2 wheel drive taxi shows up that can barely hold me and my bags. I opted for flat ground transpo to a beach hostel. 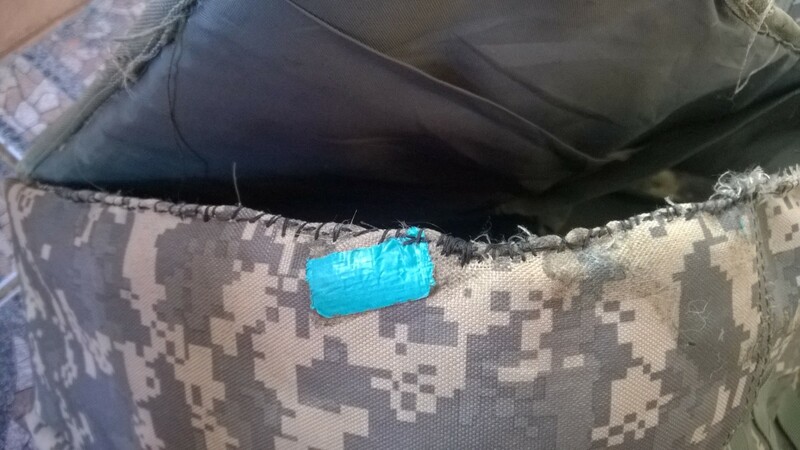 I’m telling you, this backpack was not liking the multiple rough handlings of the trip thus far. The tear was getting larger each and every transfer. The picture above shows the resulting damage that was once un-picture-worthy. So, after a night of chatting with a friend that I ran into at the beach hostel, I awoke to stitch my bag before my next bus. I broke out the supplies for repair. I decided, although it would take more time, I would do a very proper repair. I did not want to revisit this problem once completed. So, I began by stitching the 2 pieces of layered backing and facing materials together parallel to the the frayed edge. The early years of my youth with my Great Aunt Venie, and a year of 8th grade Home Economics with Ms. Smith, gave rise to my knowledge of the need for this measure. Off I went, sewing the frayed edge to near perfection of acceptable standards of Aunt Venie and Ms. Smith. But, now there was no time to complete the sewing task of joining the separated side to the back. The bus was coming soon. 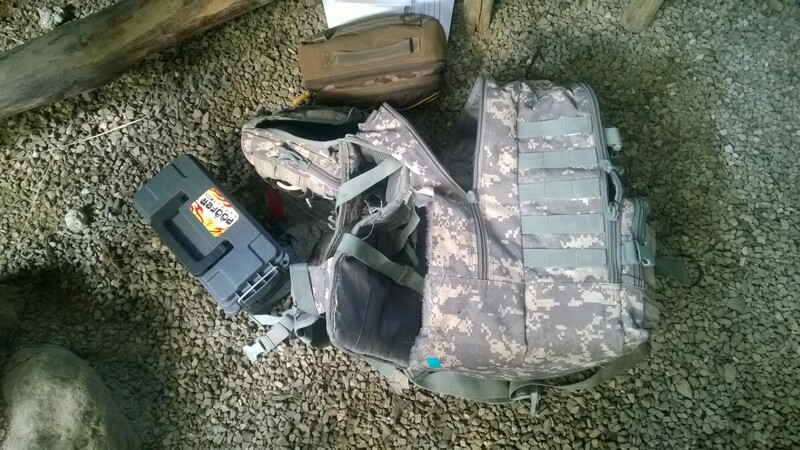 I strategically tacked the corner with several loops, and repacked the gear for that pack. The owner whisked me off to the bus stop. The bus was late. I had 2 connections to make to my final destination. A taxi pulls up. He offers me and another potential passenger a discounted ride to the next connection. We load up to head out. 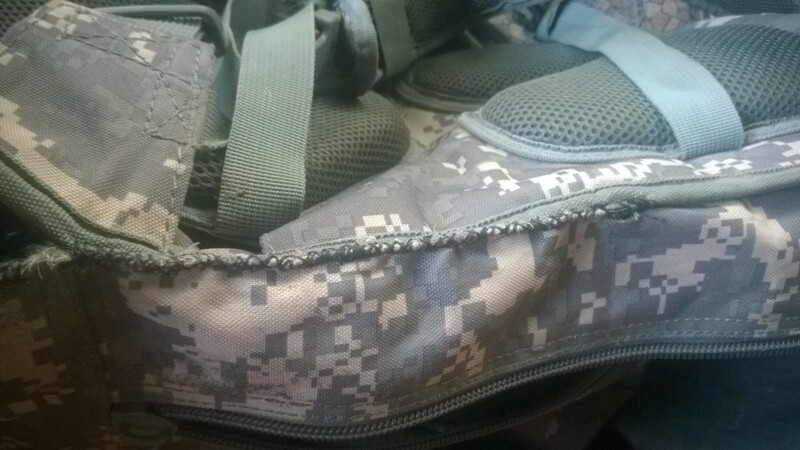 The tack loop breaks. The taxi breaks down 3 kilometers down the road. No way am I carrying this backpack anywhere without problems. Tic-toc. Tic-toc. I could be hitch hiking, but my lack of diligence before I ever set out is haunting me. Taxi is finally mended. We arrive at the connection point as the connecting is about to pull away. The taxi driver notifies the bus driver to wait. My other bags are thrown in the belly of the bus. But, I carry the ailing pack onto the bus to prevent loss and further damage. I arrive to my next stop well within time for my next connection. But not enough time to address my sewing duties. Two and one half hours of bus ride later, just before sunset, I arrive at my last stop. It is about a quarter mile walk down a bumpy gravel road, with 4 pieces of luggage, to my pre-booked room. Luckily, I made it without losing anything. I checked into my room. I had a some food at a local place. I poured a drink or 2, and swore to myself I was gonna fix this bag before it was time to move again. I wished I had been as committed to the small repair before I ever left. The next day was New Years Eve 2014. I was up to no tasks, other than relaxing after the previous journey to get there. That is not to say this task was not on my mind. New Years Eve came and went. Through recent discussions of New Years Day traditions, of which I had none, I decided to have an easy flowing day with no toiling. And that I did, as to say, I did nothing other than relax. But, the task was still on my mind as unfinished business. I had full awareness of my need to fulfill my intention of completing the repair before my next move only 3 sleeps away. I did not want to start my new year with an intention, which is a promise to my self, left unfulfilled. January 2nd rolls up just as predicted on the Gregorian calendar. Time to address tasks at hand, and tie up loose ends, figuratively and literally. After handling internet business in the morning, at some point in the early afternoon, it was time to sit down and sew. I put on some headphones and began to work. I did a loop stitch to gather the frayed edge to the previous parallel stitch. It made a better than expected rolled edge seam, gathered tightly to prevent future fraying. It looked quite nice. Aunt Venie and Ms. Smith were both smiling on my work; I am sure. And yet still, I did not have a single stitch to rejoining the side to the back! I re-threaded my needle with a enough thread to get me to a strategic stopping point. From my early teaching, I knew that it would be best if this joining repair was made in sections, rather than a continuous thread from end to end. I then joined the sections down to the stress-point where the strap attached to this seam and a perpendicular seam. And I called it good for the night. That night I had a rough night of sleep, or lack there of anyway. It was well after dawn and even a cup of coffee before I fell asleep. I awoke just before noon. I arose and made coffee and brunch. It was now time to finish this dragged out process. I was over beating myself up for putting it off in the first place. I was now on task to finish it with style, and complete a superb repair. I sat in a spot with a decent view and went to sewing. But, I was not without interruption. Other guests engaged me with talk talk about what I was doing, about their surfing and beach combing, and the like. These are main features of some of the joys of my travels, experiences and exchanges not to be discarded. Also, the previous sleepless night, I read an article about a local man who was holding Tai Chi lessons in the town I was in. What do you know? Up he walks and starts talking to the owner of the place I am staying. Although he didn’t mention it directly, he was asking the owner if he would like to join his retreat the next day. I just knew it was the man I had read about only hours before. At a pause in their conversation, I spoke up and asked if it was the Tai Chi lessons I had just read about. He smiled and confirmed. We chatted as I sewed, and the owner fielded phone calls in the midst of his conversation with the man. A German lady sat next to me and joined the conversation as well! But, through it all, I kept sewing. The conversation amongst us was wide and varied, yet still centered on how we make ourselves better, and in turn make each other better. Before you know it, the afternoon had passed, and sunset was about an hour away. But guess what… my sewing was complete! The small group looked over my work with approval, And so did I. My stitching was better than original. I looked over the rest of the pack and found other very minor failings. I looked at it closely this time. and I assessed their relation to stress points. Should I fix these other spots now? A second look, and a third look… hmmm a stitch in time saves nine…hmmm. A second and third opinion from my new friends gave me reassurance that the backpack would make it the couple kilometers up the hill to my next destination tomorrow, where I will be spending a month. During that month, I will provide ample energy to mending and reinforcing stress points on that backpack. Hopefully, this time, the stitches will be in time, to save way more than 9. And in the end, my early learned knowledge and wisdom paid off. And it has been reinforced better than ever, just like my backpack. And just as will I continue to stitch up and reinforce my backpack, I will do the same with my life and my body. Making me better than I was before. And though some of those stitches have come well after they should have, others will come before they are needed. Next stop: Yoga Teacher Training for 26 days. I wish I had known to do this 25 years ago. But now that I am, I will take every step necessary for a full, complete job. And I will be better than ever, just like my backpack. And when that is done, I will take that backpack, and we will set out on new adventures; all the more prepared to explore the world without falling apart. But when I see rip or tear in me, or my life, or my gear, I will stop and make repairs before equipment failure leads me down this road again. We all have fears. JFK said, “The only thing we have to fear is fear itself.” These last few days I have been addressing a nearly lifelong fear of drowning. At 8 years old, I fell through the ice on a gravel pit pond. I remember it vividly. The snow was deeper than I was tall. The temperature was literally less than -20*F. My friends and I bundled up for Winter adventure at the gravel pit. I could go on about the things we did, but not this blog. Suffice to say we always wanted to cross that lake. Surely it was frozen at his point. I had little if any fear. Of course, as always, I would lead the expedition because the others had fear, and rightfully so (we were a band of young daredevils). About halfway across, the ice broke. I plummeted in slow motion into the water that was well over my head. I still remember the blue ring of light from the hole. All else was grey and black. I could feel the water soaking my clothes and pulling me under more. I swam up with all my strength to the blue ring. I popped back through the hole. My friends were there with broken branches from our daredevil sledding. I grabbed on and they pulled me out to the thicker ice. My clothes began to freeze. We quickly trekked to my house, and my father tended to me there. And it was that day that fear itself was planted. I have swam my whole life. Usually by jumping off something high above the water, or swinging off a rope. But, that fear was always there. I had an incident in water just before I turned 19. I swam less and less after that. Only jumping or water skiing could really get me in anything over my head. I snorkeled with a vest a few years ago. I went surfing a few months ago. These things somewhat addressed the fear. I faced it. That is not to say I conquered it. It was standing right there on that surfboard with me. So this time, I have set out to conquer it; to slay the Dragon. I am training for my open water scuba diving certification. I am halfway there. Two of 4 open water dives complete today. The first one, a dive from shore to depth went fine. My instructor was pleased and so was I. It was amazing and beautiful, serene and surreal. I felt great. But, I knew that Dragon was not dead. He was injured and bleeding, but not dead. A good lunch and a short nap, and it was time for dive #2. We got in the boat and headed for open water. As the island diminished behind us, the Dragon tapped me on the shoulder. I was not surprised. I knew he was there the whole time. A pre-dive buddy check, a quick how-to, and I was rolling off the boat backwards into over 40 feet of water without a pedestal anywhere. That Dragon was breathing fire now. Some deep slow breaths and calming words from my instructor brought me around to the task at hand. We didn’t come out to bob on the surface. We came to dive. Down we went, forty feet. The Dragon was drowning. But, he wasn’t going down without a fight. He reared his ugly head. I looked up and saw the blue ring. I couldn’t get enough air. I signaled to go up. My instructor gave me the OK? signal. I shook my head ‘no’. The Dragon was standing on my head crushing me with visions of the blue ring and questions of why I was there, and spears of self doubt. The water seemed so heavy. I was breathing too shallow. I convinced myself I had an equipment failure. I had every weapon of knowledge, and the Dragon laughed. I ditched those weapons and headed for the surface, albeit too fast. My instructor stayed with me. We broke the surface to the air. My mouth was clenched to the regulator. I was still breathing through it. There was nothing wrong with my equipment. My instructor asked me what was wrong. I told him fear was there. He scolded me for the fast ascent. I had endangered him and myself. He talked me through the fear. He reminded me of my successful dive earlier that day. It was time to carry on or get in the boat and call it quits. Not my style, time for another round with the Dragon. We made a slow descent. My instructor aware of, and guiding my breath. We got down to 30-something feet. “OK?” was the signal. “OK”, I signaled back. Instead of doing the tests right away, we took a leisurely swim. We went over the coral and vegetation to the next sandy bottom. I was ready to beat the Dragon this round. I flooded my mask and cleared it twice. I pulled my air regulator from my own mouth and threw it behind me. And then calmly, with textbook style, I recovered it. I purged it with my own fire-breathing Dragon breath, and began breathing underwater again. I was thrilled. And, my instructor was happy and congratulatory. Finally, we simulated out of air and air sharing return to surface. Simulated indeed. We were still on the bottom with air for about 30 more minutes of exploring the reef. The fish welcomed us. The sea fans waved like angel wings. I looked around 360*. The Dragon was gone for now. I played with fine tuning buoyancy with my lung capacity. We practiced hand signals and enjoyed the scenery until my air was low. The last exercise before surfacing was an out of air, buddy assisted, alternate air ascent, slowly to the surface. I was disappointed the time had went by so fast. I was happy the Dragon was down, and that I was loading into the boat without him. Tomorrow is the last confined dive, and 2 more open water dives. If I beat the Dragon those 3 rounds, I will surely ace the certifying written test. I now know that in the end, I do not have to slay the Dragon. All have to do is not fear him. JFK didn’t say, “Have no fear.” He told us to not fear the Dragon. That is what will get ya. I hear ya, Jack. And your words will be on the ocean floor with me tomorrow. So, today was a beautiful day. Rain clouds circled the local cayes all day. But the Sun prevailed, and visibility at 60ft below was promising to be clear. I had breakfast and went over my studies with my instructor. Then some yoga, and a short meditation. It was time to dive again. Out into the open waters to Stovepipe reef. It was quite fitting, and comforting, that Captain Jack, a local fisherman was at the helm. Again in the choppy waters I sparred with the Dragon, all the way to sea floor. I touched bottom and demonstrated skills for my instructor. I did not fear the fear. President Jack’s words were with me. I knew at that moment that there were hundreds of people all over the world safely scuba diving. I was safely scuba diving too. All of our equipment checked out fine. We had plenty of air. I had a great instructor as my dive buddy. And he was relaxed and smiling. Like all the other skills he taught me, I mimicked those. The Dragon was tamed. I need not slay him. I put him on the leash that I had been on. Lunch, nap, yoga, meditation and it was time to dive again. I was ready. We did skills again, and added navigation with a compass. Then it was tour time. It was my time. I was free and breathing in calm clear waters 60 feet under blue choppy seas. I was better at controlling my buoyancy. We got close to the coral teeming with fish, lobsters, crab, sponges, and surreal vegetation. I could see the blue ring. It was OK. Captain Jack was up there waiting, just following our bubbles. I could have stayed down for another hour, but conserving air will be an acquired skill on my next dives. I wonder if the Dragon needs a wet suit. I have mixed feelings about pets wearing clothes. Oh yeah, Bob Marley was right. I saw theses 3 little birds when I first got here. And I knew, “Every lit’l ting is gonna be all right” I took this picture to remind me. After my late night with the two Annes, I got early start as the sun rose in cloudy skies. With advice garnered the night before, I made my way to the taxi stop. Within minutes I got a ride, that afterwards I realized I could have walked in the same amount of time. Once again, I had unwittingly contributed to the local economy. The local island hopper was very accommodating. The lowing flying high-wing 4-seater provided great views of the shallow bottoms of the Belizean coastline. The gravel surfaced runway at the Belize Airstrip, was was right at the water’s edge. With a 30-or-so minute layover, I thought I’d find a coffee. Luckily, this terminal had a small kitchen, attended by a modern-day Maya named Mira. Upon my refusal of styrofoam (especially in a microwave), she graciously made my microwaved hot water (for instant coffee) in her personal coffee cup. I decided to try one of her homemade not-too-sweet coffee cakes. We continued our conversation about my anti-styrofoam stance, which transitioned to the origin of her cup. It was a gift from her son. She had kept it for 23 years. He had given it to her around 1st grade age. He was killed at the age of 22, during a hurricane a few years back. So, we engaged in topics of life and death, love and marriage, and home and travel, all of them overlapping. Finally, off again on my final leg to Dangriga in an 8-seated, dual-prop high-high wing. I got a taxi to the dock. We stopped on the way to make change. It forced me to buy a couple beers. It is quite rude to just ask for change… Right? I was dropped at the dock. I was informed my boat crew was out shopping and would return in an hour. I went into the nearest cafe and ordered some local fare. An obviously poor local began chatting me up. Rather than give him change, I offered him lunch. He accepted, and promptly started giving all the local tips, and included valuable bus route information for my exit upon return from the island. My island host showed up and said he still had a couple things to handle. I told him, “No hurries, no worries. I am on vacation.” He looked at me and smiled. We were gonna get along just fine. The boat ride out was beautiful and uneventful. I occasionally turned to see the mainland disappear behind 9.9 nautical miles of blue Caribbean seas. I was barely unpacked when a light knock and a child’s voice told me that my lunch was ready. The afternoon followed with travel conversation with soon to be departing guests. In the lull, I caught a nap. Afterwards, I took a walk. I talked with a local fisherman cleaning conch that would be my dinner that night. He said that he would free dive about 15 feet down for them. As we chatted standing in the shallow water, several manta rays came and fed on the trimmings at our feet. We could touch and stroke them. They were even playful with us and each other. The evening came on and dinner was served. I dined with 2 couples, one from Wyoming. And the other couple were newlyweds from Rome. Conversation with the host was wide and varied for the rest of the evening. The sprinkles grew into a true rain as I turned in for a good night of sleep. The steady pitter-patter sent me softly into another dreamland. I awoke to a foggy predawn twilight and the sounds of the warm sea lapping the rocks and sandy beach. I languished in bed listening to the birds, ocean, and wind in the trees. After breakfast, I walked a couple laps around the small island, stopping at a small shack selling beer and snacks. I ordered a Belikin. While I chatted with the shopkeeper, Margot, she offered up a shot of a concoction of bitters liquor and herbs. It was quite tasty. Now, after lunch, sitting on the deck watching pelicans dive for fish about 10 feet away, I feel like another nap. A fine slice of paradise I have found to learn to scuba dive…. Last night I was as prepared as I have ever been for a trip. I pared down a pile of stuff into a 35lb backpack and a 15lb duffle bag. I felt like I was slightly over packed, yet I felt everything had its purpose. I decided I would bare this weight, figuratively and quite literally. Still, I could not bring myself to sleep. I was restless and excited to embark on a journey I had envisioned years ago. This plan lay dormant until the possibility arose late last year. I came up a few dollars and a few days short of being able to make it happen, and still adhere to my commitments further down the calendar. This year things fell into place, and it has now come to fruition. I was preparing to cross the smallest continent by backpack. I began by crossing the border from North America into Central America over land. Sure I could just fly into Belize City and begin there. But, it just seems worth the effort to cross that border by land. It just seems more complete in my mind. So there I sat, waiting for my dawn departure to Cancun. Fidgeting with my luggage contents and their optimal placement, and other busy work to kill time. Sleep was only a concern to be avoided. No way I was going to miss my flight by over sleeping. I made it thru the airport in stellar fashion. I paced the terminal until boarding. Sleep came quickly after reaching altitude above the freezing cold and snow storm below. I awoke in the B seat, between a retired couple, who purposely chose their seating arrangement. We had pleasant and humorous conversation for the short remainder of the flight. Luggage pickup, customs, and duty free booze were a breeze. Less than 10 minutes later I was on the bus, and on my way to my transfer to the border. The transfer had a little confusion and a slightly late bus. The bus shows up and I am one the last to board. Luckily I get my prefered seat on the driver’s side, which is also the ocean side. Another stroke of luck; my phone begins chirping with accumulated emails and texts. One of which saying that I have unlimited text and web, because (unbeknownst to me) it was part of my global connection plan that included a national Mexican carrier. With a long ride ahead of me, I figured I would tap out a blog post thru traffic, and sleep the long steady ride. As I transitioned from this surreal moment demonstrating the frailty of life, I noticed to that my phone had died as well. And with it, my blog post was gone too. I pictured the young man’s soul riding the lost radio waves of my post into another dimension. I recited the Gayatri Mantra 3 times to ground my experience, and perhaps propel him peacefully to the great beyond. I slept restlessly for the next few hours of the bus ride, as the sun sank in front of the windshield. And the day turned into night. I arrived at the terminal hungry. With the help of an unknown fellow on the bus, I sorted a taxi ride to the border. But first, local fare from a street vendor. Delicioso! The friendly taxi driver overcharged me a bit, but was very pleasant. He spoke some English and gave me the lowdown on crossing the border. The Mexican exit was $25, but otherwise friendly and painless. The Belizean entry was free and easy. I was happy to be back in Belize. A place where English is taught in school and the exchange rate is a quick 2 to 1. While waiting for the van to town, a young girl who had overheard my destination at the terminal, offered a free ride with her and her father. They brought me to this guest house. I had great conversation on socially and environmentally pertinent topics, with two lovely Belizean ladies, both named Anne, as we drank icy rum and Cokes. I knew I would not sleep until I penned or tapped this blog post. But, the time was well spent with them.